Schlumberger has announced the opening of a new purpose-built Production Technologies Center of Excellence aimed at solving customers’ global challenges related to oil and gas production chemistry, particularly those encountered in deepwater, heavy oil and other extreme environments. Supporting worldwide operations, the center features nine laboratories that combine the best of Schlumberger process systems, production software and advanced chemistry. Forty research scientists are dedicated exclusively to product development and formulation activities that maintain asset integrity, address flow assurance challenges and remedy production issues, such as deposit formation and naturally occurring gases. 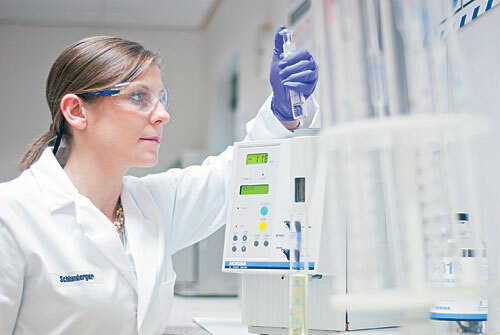 Integrated production workflows, uniquely available through Schlumberger, combine the testing of reservoir fluids with advanced chemistry to support the development of specifically tailored chemicals and facilitate the testing of formulations under customer-specific conditions. The diverse development and testing capabilities available in the center aided a customer in the Middle East that sought to decontaminate electrical submersible pumps with an in-situ solution to prevent unnecessary prolonged shut-in and mitigate costs of pump reconditioning. Schlumberger production chemicals experts recommended a scale dissolver solution for in-situ removal of NORM sulphate scale, which helped the customer reduce well downtime, well remediation time and costs, while restoring full production. Schlumberger also has a worldwide network of regionally located laboratories that support production chemicals operations, which enables customers to optimise production chemical treatments from reservoir to refinery.